A fun re-telling of the Christmas story for young children, including regular invitations to make some noise! 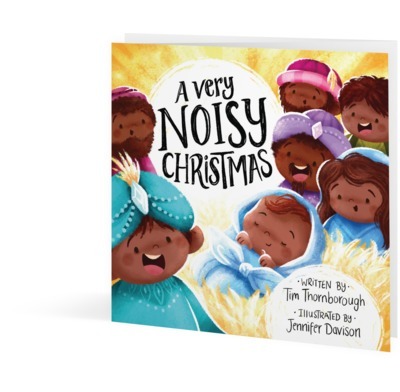 This fun and fresh retelling of the Christmas story comes with invitations to make some noise, so that children can join in as parents read to them. But it also shows children that at the heart of the Christmas story is something we should all be quiet and see: God's Son Jesus was born, so that we can be friends with God forever. This is the second time we have used a Christmas story book w at our Crib service to give a fresh and interactive version of the Christmas story. We projected the downloadable images, had a narrator and some actors to be the shepherds/angels/wisemen (changing costumes quickly) and the congregation joining in the with the 'Shhhh' etc. It was great! Used the book and the downloadable PDF pictures for 'Jesus' Birthday Party' event. It made a great way of sharing the Christmas story in an interactive way...lots of noise was made! This is a bright, well-illustrated book with a fun way of getting across the message of Christmas to young children. Highly recommended. I used this for our local school nursery kids and they loved it. The combination of loud and soft - and repeating the loud words especially kept them very engaged. The nursery teacher loved it too and wanted a copy for herself - she now has mine - I'll be back next Christmas! I bought this book with my 2 and 4 year olds in mind and they loved it. You read some bits quietly and some bits loud which they found entertaining! We have just used "A very Noisy Christmas" (turning it into a script for 2 storytellers, with the illustrations on powerpoint) at our toddler group carol service - it was great at engaging the children (pre-schoolers) as they particpated well with storytellers' "Shhhhhh"s and "WOW"s and heard the Christmas story of rescue in an exciting way. The guests have all taken a copy of the book home to read again with their families. Thank you for this resource... I imagine we'll be doing the same thing again next year! Tim has done an amazing job with this retelling of the Christmas story. I was so thrilled when our three year old granddaughter received this from her playschool. Charlotte loves it. Throughout the book there are lines to shout and lines to whisper which I think children will love. It describes Jesus as the rescuer and king of all the world who came so that we could be friends with God so if giving to non-Christians then I think it will not seem too wierd to them. My only tip to the publishers is that if you do another print run in the future, it might be better to use a thicker and slightly bigger font for the normal text in the book as that would make it easier for children to read along too. I would recommend all Christian families have a copy and it is ideal as a gift.